PriceExpert must have entered your computer bundled with freeware apps you have downloaded from unfamiliar file sharing websites. You probably did not even want to have PriceExpert in the first place, but now that this application is up and running in your system, you certainly have to deal with it. It would be in your best interests to remove PriceExpert from your computer as soon as possible because this application is an adware program that can show commercial ads with outgoing links to unreliable websites. When it comes to computer security, you should not overlook even the slightest possibility that could eventually lead to a malware infection. PriceExpert seems to come from the same Shopmania adware family as ShopzyApp and Price Defend applications. The program functions as a browser add-on, and it has an official homepage via priceexpert.com. Technically, it is possible to download PriceExpert from the official website, but users seldom come across the site in the vast spaces of the Internet, so adware find other means to spread around. As mentioned above, PriceExpert most probably gets around in software packages and the unsuspecting users do not even realize they install this unwanted application on their computers willingly (albeit unwittingly). Consequently, there is a good chance you have far more unnecessary programs to remove from your system, so you might as well get down to it. Some users choose to ignore PriceExpert and leave it be. However, just because the official website says that the application can help you “get the best prices out there, while browsing the web for products,” it does not mean that PriceExpert lives up to its promises. Naturally, the application does show you various coupons and discount offers, but some of them might as well be embedded with malicious links that are part of online marketing schemes. In the worst case, PriceExpert may inadvertently lead you to websites the distribute adware and malware. Then you would face all types of problems, depending on what you would get infected with, Trojan, ransomware, fake antivirus, or any other type of malware. The bottom line is that if you want to avoid such serious security issues (and you most certainly do), you have to remove all the potential security risks early on, and PriceExpert definitely falls into a potential risk category. Open Control Panel and uninstall PriceExpert manually. Then remove any remaining add-ons and plug-ins from your browser following our instructions below. Your computer’s security will be ensured once you acquire a reliable antispyware tool that will run regular system scans, preventing potential threats from entering your PC 24/7. Slide the mouse cursor to the bottom right corner of your screen. When the Charm bar appears click Settings and go to Control Panel. Click Uninstall a program and remove PriceExpert. Click the Start menu button and navigate to Control Panel. Go to Uninstall a program and remove PriceExpert. Open Add or remove programs and uninstall PriceExpert. Press Alt+T and go to Manage add-ons. 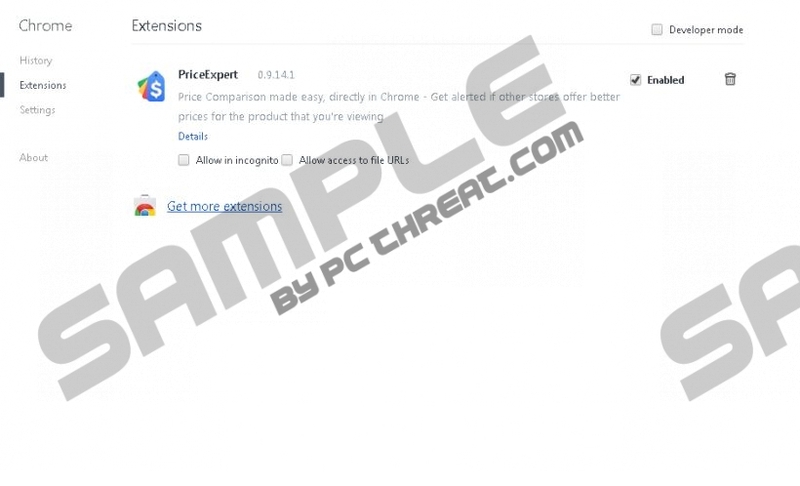 Remove PriceExpert from Toolbars and Extensions. Disable and remove PriceExpert from Extensions. Press Alt+F and click More tools. Open Extensions and remove PriceExpert. Quick & tested solution for PriceExpert removal.